The FTSE, CAC and DAX all opened up flat after an inconclusive session on Wall Street overnight. Worryingly an upbeat start to the trading session yesterday, reversed in the final hours of trading which has now occured two days in a row whereby the US markets have made new highs for 2009, only fall back and record negligible gains or losses. It is a striking contrasting to the behaviour of the Dow Jones during the upswing starting in July. This was characterised by enthusiastic buying in the final hours of each session which rescued many days from potential sell offs. Could this new trend of late session sell offs be a sign of a reversal in sentiment? The main economic announcements today come from the US with Core durable goods orders at 12.30 GMT and new home sales at 14.00. Crude oil inventories at 14.30 could also cause some excitement. It’s been a relatively quiet day thus far on the fores markets with Sterling showing some slight weakness against most other currencies. The euro appears strong today, but the pick of the bunch is probably the AUD/JPY which is benefitting from oil’s refusal to dip much below $70.00. 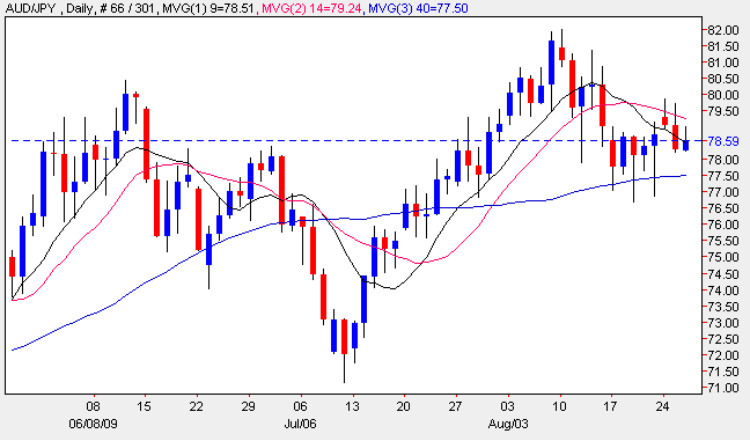 With crude inventories out today, AUD/JPY could break out after a period of range bound trading. A Breakout trade through 80.00 and 77.00 could be the best way to play this today.